Album: "Moustache (Half A Scissor)"
Review: Mr. Oizo enjoyed a lot of success for a little while with his "Flat Beat" tune that was featured in Levi's commercials along with "Flat Eric" - a yellow sock monkeyish puppet which aggressively bobbed its head to the tempo of the song in the hit music video. When I visited the UK, you couldn't go near any HMV store without seeing tons o' Flat Eric dolls for sale. Sadly, as fun as the song and video were, Mr. Oizo fell off most people's music radar when he stopped doing videos involving the puppet. True, there was a time period of about 5 years where he didn't put out a new album, which didn't help matters much, but he still stayed in my rotation when he released the "Last Night A DJ Killed My Dog" single to help tide things over until his next full release. Finally, in 2005 he released "Moustache (Half A Scissor)" - a new album which took his music in a very different direction. Yes, it still had the elements of his quirky minimalist style that caught my attention years ago, but many of the tracks sound like they were taken directly out of an old 16-bit video game. Interspersed throughout the album is a digitized voice commanding you to "Kill. Kill everyone. This is computer music. Shoot or die." Sounds like good advice to me. While it doesn't have the inherent catchiness of "Analog Worms Attack", it's definitely worth checking out as it's proven to make for some great driving music. One listen to tracks like "Nurse Bob", "Stunt" or "Square Surf" and you'll know exactly what I'm talking about. So if you're looking for something completely different from the norm, and you don't mind instrumental computer music in all of its glitchy glory, give this unsung Mr. Oizo album a shot. They Might be Giants has a song called 'Youth Culture Killed my Dog'. If we could round up a few more songs involving dog killings, we could do a themed radio show. If we had a radio show. Stephen Lynch has the song called 'Kill a Kitten' with a line in the final verse that states, "Kill a puppy dog instead". Would that work? 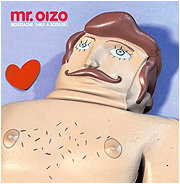 I checked into Mr. Oizo and I've never heard anything like it before. I don't know what to make of it. Heheh, it's not for everyone. Analog Worms Attack is a bit more accessible for most people I think, so you might wanna try that one if Moustache (Half A Scissor) isn't your cup o' tea.